At our figure sketch group we want to paint a person doing a real action, rather than holding an artificial pose. So we ask Sarah to bring her pottery supplies and to do her normal work. We agree on a base pose that she can return to from time to time. We talk to her during the pose, so she's not holding totally still. 1. I draw with the brush on gesso-primed canvas mounted on a Masonite panel. I begin the quick block-in with casein. Casein is a good underpainting medium. Right away I'm looking for the big shapes of tone, in this case her light face and figure against the simple dark background. 2. I begin to overpaint with oil on the face, hair, and background. Eventually, about 95 percent of the surface will be covered with oil paint. The oil paint achieves deeper values than the casein because of its glossiness. I have three cups: Gamsol for thinner, Liquin, and a slow-drying medium (equal parts stand oil, damar varnish, and turpentine). 3. I simplify the tones in the arm and shoulder and torso, painting them with very little value variation and using color temperature to turn the form instead. Consequently, the front plane of her shoulder has a slightly cooler cast. The key light is a warm incandescent. 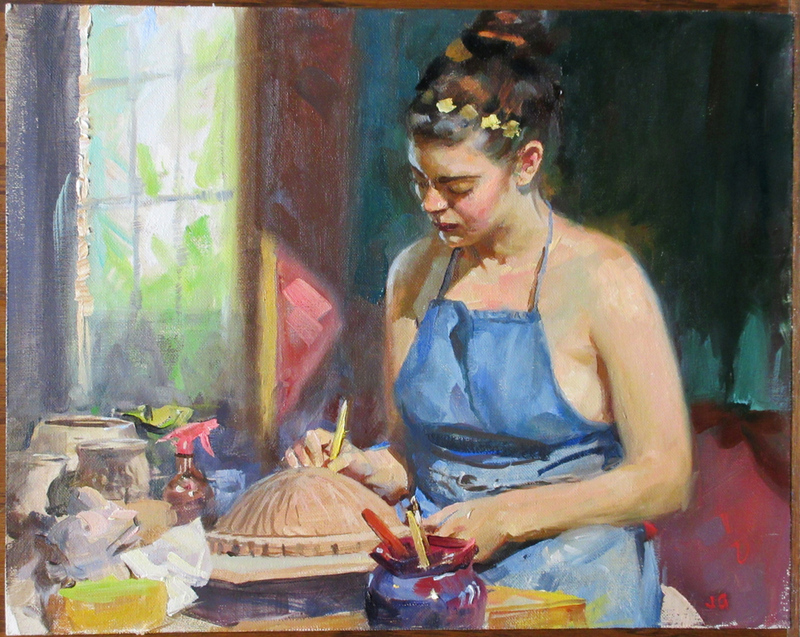 I introduce the window into the composition to motivate the cool edge (or "rim") light. Her hair melts into the simple tones of the background. On the left, I paint the window mullions and other background details out of focus. In contrast to those empty shapes, I revel in the sharp accents and clutter of the worktable. Studio host Garin Baker paints next to me. 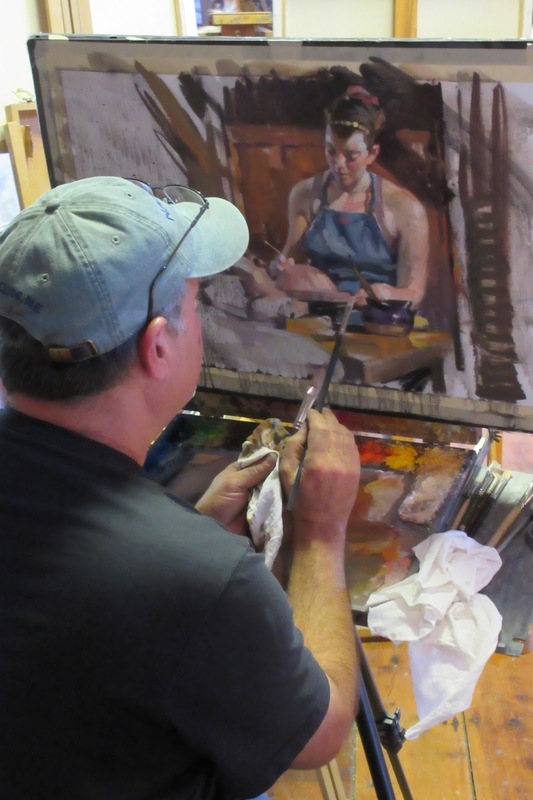 He'll be leading a painting workshop with Max Ginsburg and Christopher Pugliese this October in Bryn Mawr, Pennsylvania. Here's the link for more info. Fun times and great camaraderie! Top row: Amber and John; Sarah, Kev Ferrara; Garin Baker and Jeanette, Not shown, Janet, John Varriano, and Mary Mugele Sealfon. Daily servings of color, light, and Dinotopia on Instagram. I left out a lot of things in the scene. The shirt was very close to the skin tone, and I thought it would be confusing if I tried to paint it. Hi James, how do you deal with painting in an artifical lighting situation? I found it a bit difficult to mix colours which are also faithful at daylight. I like her just wearing an apron, looks more timeless to me. What a great idea... We've had folks pose in costume, but this is more interesting (probably challenging). 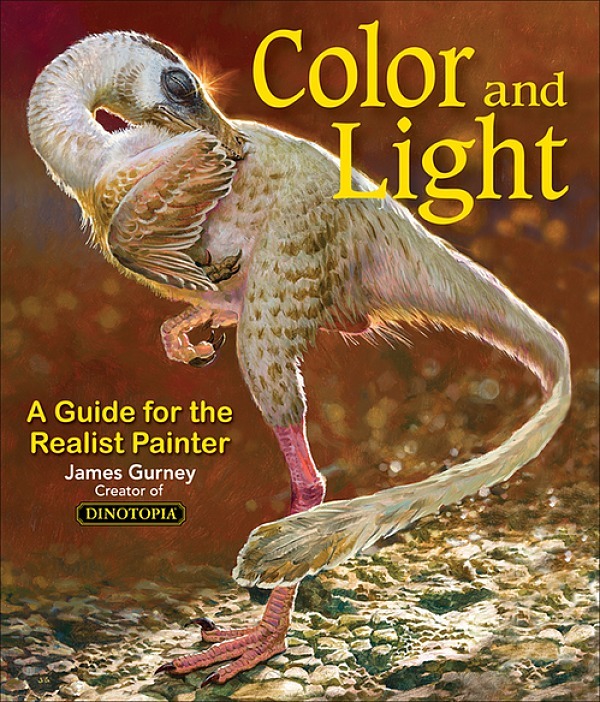 Also, we nearly got into fist cuffs over the lighting in the past; I'm a "over the head at 45deg angle" kind of guy, but some of the ladies wanted a second light to add color to the shadows... confusing to me; but if James Gurney says it's okay, I'll have to capitulate! Would it make any sense to underpaint all darks with casein or acrylic? And just have oils for midtones and lights and maybe minimal touchups in the darks? Isn´t that advisable due to the different shine of the paints? Btw: That painting of the train station in goauche is really worth framing. A lovely piece. Congratulations! As always, good post. I'm wondering about your medium: Liquin, which fast drying, and the oil,Damar and turp which is quite a bit slower. When do you use one or the other in the same painting? 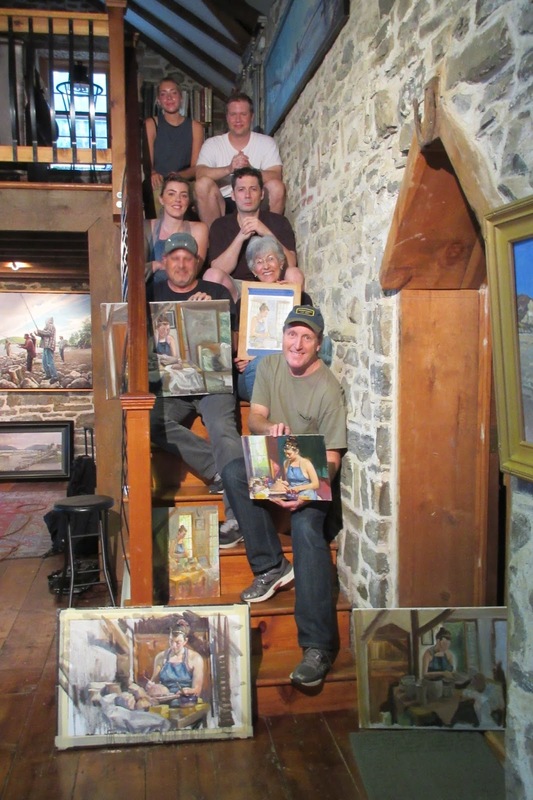 Thanks for sharing --Great painting! So with the casein underpainting, you used real gesso to prime your board -- not the acrylic-vinyl primer we tend to call gesso, right? I'm curious about the "feel" of the oil paint as it goes on -- how does it differ from acrylic primed or oil primed surface? I'm also curious about the casein underpainting, from the texture it leaves I'm surprised it makes a good archival base for oils. Judy and Daroo, it was a fine cotton canvas with a few coats of standard acrylic gesso. The casein went on nicely to that and I worked in casein for about the first hour. When I went over it with oil, it felt like halfway between a gesso ground and an oil priming: not too absorbent, but not slippery either. I liked the way the oil could bring it down a couple of values from the underpainting. Allen, I used the Liquin for quickly stated crisp details, like the stuff in the lower left. I used the slower medium more for the face and figure, which needed to stay workable longer. Thanks, Gyrus. Whichever medium you use, I would use it for the full range of modeling factors: lights, midtones, and darks. Arturo, we tried out an LED light at first but we all felt it was too cool, so we went to a Mole Richardson Tweeny Solarspot, a nice powerful model light that goes up to about 14 feet on the stand, and it has barn doors so as not to shoot too much light into the eyes of the folks on the far side of the room. Tobias, thanks. As long as the light on your painting/palette/ and model are all equivalent, it shouldn't matter too much what light you're working in. Incandescent is full spectrum light, even though it's biased strongly to the yellow-orange side, making the window light seem very cool by comparison. A couple more questions about the casein underpainting: I know that casein dries quickly, but did you feel the need to pause to make sure it was dry enough to avoid a poor reaction from any mixture of the water-based underpainting with the oil? Also, underpainting in acrylics is something that I know some people are fond of - probably for similar advantages as those you find with casein. But others caution against delamination of the upper oil layer because of poor adhesion between the two types of paint. (Still others swear this problem is mostly hypothetical.) 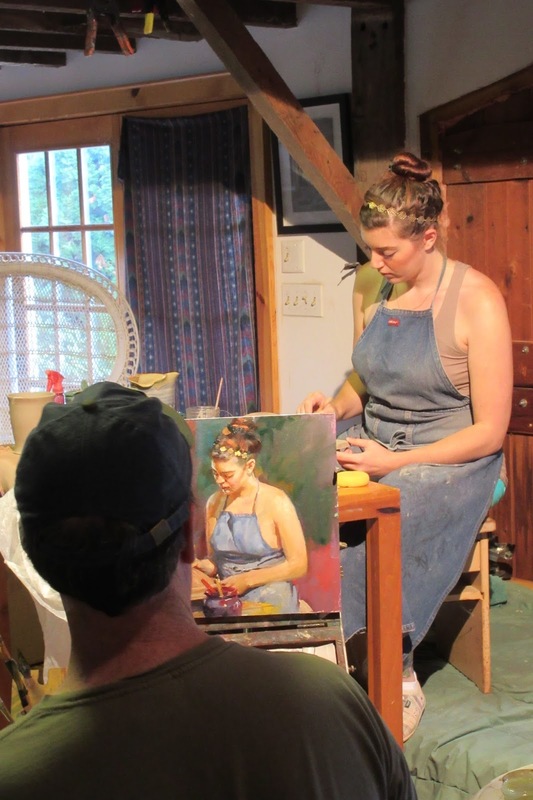 Have you heard of similar concerns regarding casein underpainting? 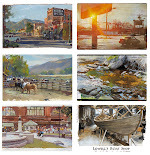 James, it's time you produced a DVD on oil painting techniques! You've demonstrated the qualities of many types of media, but I'll bet oils are your favorite.